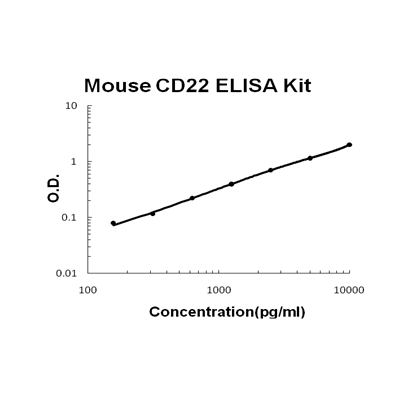 Sandwich High Sensitivity ELISA kit for Quantitative Detection of Mouse CD22. 96wells/kit, with removable strips. CD22 or cluster of differentiation-22, is a molecule belonging to the SIGLEC family of lectins. This gene is mapped to 19q13.2. It is found on the surface of mature B cells and to a lesser extent on some immature B cells. Generally speaking, CD22 is a regulatory molecule that prevents the overactivation of the immune system and the development of autoimmune diseases. It is a negative regulator of antigen receptor signaling whose onset of expression at the mature B cell stage may serve to raise the antigen concentration threshold required for B cell triggering. CD22 functions as an inhibitory receptor for B cell receptor (BCR) signalling. This gene can downmodulate signaling through the IgM and IgD B-cell receptors(BCRs), but not through the IgG BCR, because the IgG cytoplasmic tail prevents CD22 phosphorylation and actually enhances IgG-BCR signaling.